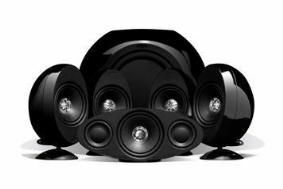 Sizzling summer discounts on KEF speakers | What Hi-Fi? "Times are hard for consumers right now, with rising prices in the high street reflecting the results of the downturn in the economy," says KEF's UK managing director Steve Halsall. "So we at KEF want to help our customers by offering genuine savings – not on end-of-line models, but on some of our most popular premium products,"
Option 1: Upgrade your subwoofer for free and save up to £250. Option 2: Choose a pair of free stands and save up to £500. Option 3: Get wireless rear speakers at a discount and save up to £350. For example, in Option 1 you can upgrade the subwoofer on the KHT2005.3 system from a Kube-2 to an HTB2SE, and save £200. Or on the Award-winning KHT3005SE set-up you can upgrade from the HTB2SE sub to an XQ60B and save £250. And if you fancy wireless rear speakers on the KHT9000 system, you'll save yourself £350. For full details of KEF's summer offers, visit your local dealer or www.kef.com.